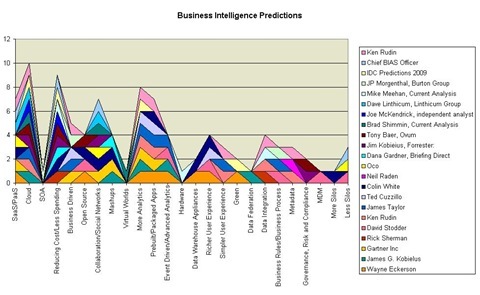 A More Complete List of 2009 Business Intelligence Predictions? Jorgen Heizenberg, Business Intelligence Predictions 2009: The paradox between demand and supply. Integration of BI with social software and collaboration workspaces to facilitate sharing and exploitation of knowledge in a collaborative environment. This is particularly relevant for those of you wishing to exploit products IBM Lotus Quickr quickplaces as well as Microsoft SharePoint workspaces. Integrating BI here will become increasingly important in 2009. Craig Shiff: What’s Ahead for Performance Management in 2009? "2009 should be another great year for business performance management, the established vendors, consultants and, most importantly, the end users of performance management and business intelligence solutions." Companies will continue to invest in performance management. "While only 9% said the economy is causing them to reduce their focus on BPM, more than 51% of the respondents so far agree that BPM is more critical than ever and are increasing their efforts in that area (the remainder say their BPM plans have not been impacted one way or the other by the current economy)."